After my previous attempt and failure to go to Fukuryu Rapas Bunke, I had the itch to go back. 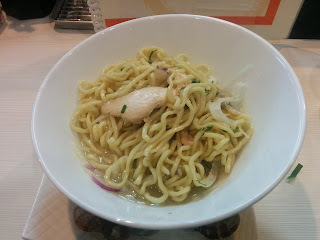 As soon as I had a free moment, I headed over to Sakaisuji Honmachi to try the strange ramen pasta fusion place. They offered clam, curry, and chicken rapas. Without having any real idea which one to go for, I picked the first on the menu, the clam. What is rapas? It turns out it's a half-way point between pasta and abura soba. 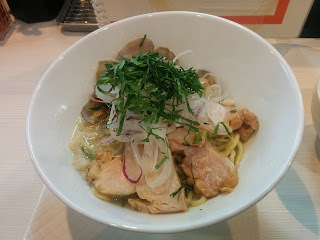 Looking at the bowl, you would expect it to be a wacky abura soba, complete with thick noodles, onions, and some chewy, tangy pork. But mixing the tare in, and summarily the rice and tomatoes meant for the end of the meal betrays a garlic clam sauce that would be fit for a light pasta dish. Is it ramen or pasta? I'm not sure, but it was pretty good. This was very strange. So yes.